TIs have been used in engineering superconducting topological superconductors (TI/SC), by growing TIs on a superconducting substrate. Since their experimental discovery in 2007, TIs have intrigued condensed matter physicists, and a flurry of theoretical and experimental research taking place around the globe has explored the quantum-mechanical properties of this extraordinary class of materials. These 2D and 3D materials are insulating in their bulk, but conduct electricity on their edges or outer surfaces via special surface electronic states which are topologically protected, meaning they can't be easily destroyed by impurities or imperfections in the material. Now, a novel sample-growing technique developed at the U. of I. has overcome these obstacles. Developed by physics professor James Eckstein in collaboration with physics professor Tai-Chang Chiang, the new "flip-chip" TI/SC sample-growing technique allowed the scientists to produce layered thin-films of the well-studied TI bismuth selenide on top of the prototypical SC niobium—despite their incompatible crystalline lattice structures and the highly reactive nature of niobium. 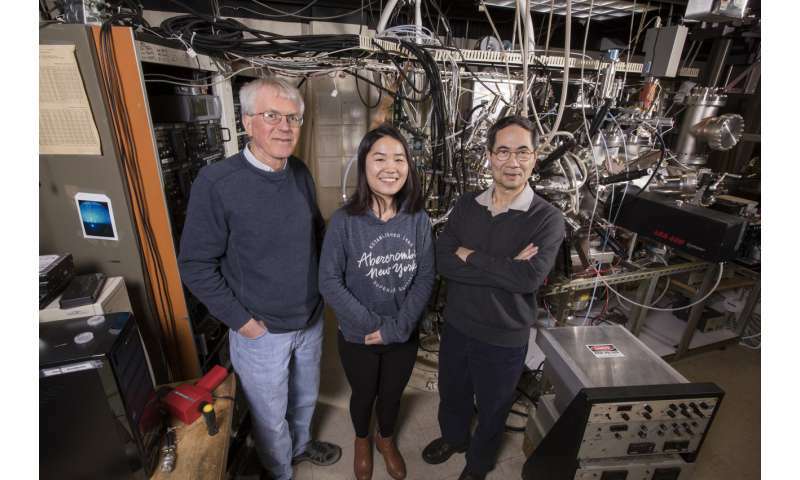 These two materials taken together are ideal for probing fundamental aspects of the TI/SC physics, according to Chiang: "This is arguably the simplest example of a TI/SC in terms of the electronic and chemical structures. And the SC we used has the highest transition temperature among all elements in the periodic table, which makes the physics more accessible. This is really ideal; it provides a simpler, more accessible basis for exploring the basics of topological superconductivity," Chiang comments. The method allows for very precise control over sample thickness, and the scientists looked at a range of 3 to 10 TI layers, with 5 atomic layers per TI layer. The team's measurements showed that the proximity effect induces superconductivity into both the bulk states and the topological surface states of the TI films. Chiang stresses, what they saw gives new insights into superconducting pairing of the spin-polarized topological surface states. "The results of this research are unambiguous. We see the signal clearly," Chiang sums up. "We investigated the superconducting gap as a function of TI film thickness and also as a function of temperature. The results are pretty simple: the gap disappears as you go above niobium's transition temperature. That's good—it's simple. It shows the physics works. More interesting is the dependence on the thickness of the film. Not surprisingly, we see the superconducting gap reduces for increasing TI film thickness, but the reduction is surprisingly slow. This observation raises an intriguing question regarding how the pairing at the film surface is induced by coupling at the interface." Chiang credits Eckstein with developing the ingenious sample preparation method. It involves assembling the sample in reverse order, on top of a sacrificial substrate of aluminum oxide, commonly known as the mineral sapphire. The scientists are able to control the specific number of layers of TI crystals grown, each of quintuple atomic thickness. Then a polycrystalline superconducting layer of niobium is sputter-deposited on top of the TI film. 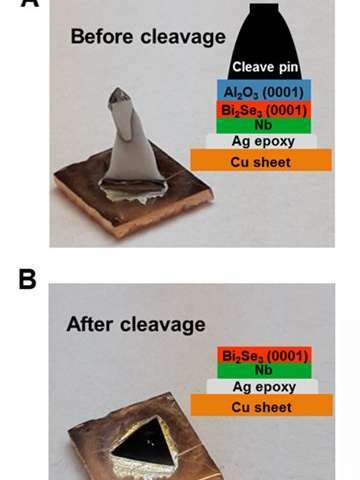 The sample is then flipped over and the sacrificial layer that had served as the substrate is dislodged by striking a "cleavage pin." The layers are cleaved precisely at the interface of the TI and aluminum oxide. Eckstein explains, "The 'flip-chip' technique works because the layers aren't strongly bonded—they are like a stack of paper, where there is strength in the stack, but you can pull apart the layers easily. Here, we have a triangular lattice of atoms, which comes in packages of five—these layers are strongly bonded. The next five layers sit on top, but are weakly bonded to the first five. It turns out, the weakest link is right at the substrate-TI interface. When cleaved, this method gives a pure surface, with no contamination from air exposure." Chiang acknowledges, "The superconducting features occur at very small energy scales—it requires a very high energy resolution and very low temperatures. This portion of the experiment was completed by our colleagues in the University of Tokyo, where they have the instruments with the sensitivity to get the resolution we need for this kind of study. We couldn't have done this without this international collaboration." 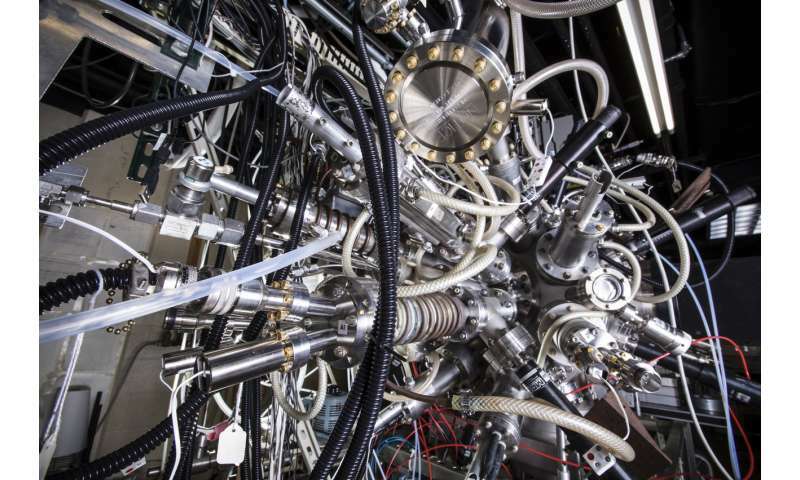 "This new sample preparation method opens up many new avenues in research, in terms of exotic physics, and, in the long term, in terms of possible useful applications—potentially even including building a better superconductor. It will allow preparation of samples using a wide range of other TIs and SCs. It could also be useful in miniaturization of electronic devices, and in spintronic computing, which would require less energy in terms of heat dissipation," Chiang concludes. Eckstein adds, "There is a lot of excitement about this. If we can make a superconducting TI, theoretical predictions tell us that we could find a new elementary excitation that would make an ideal topological quantum bit, or qubit. We're not there yet, and there are still many things to worry about. But it would be a qubit whose quantum mechanical wave function would be less susceptible to local perturbations that might cause dephasing, messing up calculations."